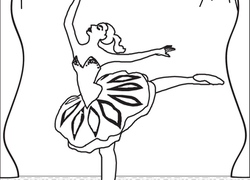 Budding ballerinas can learn their ballet positions in this combo coloring page and guide sheet. Enjoy a music-themed coloring page with your child. This one shows a violin, one of many stringed instruments. Musicians and music lovers alike, here's a great coloring page for you! Get some quality coloring time with your child, and tell him a bit about the guitar. Have you ever met such a musical dinosaur? Color in this silly page. Get your tights in a line with this coloring page, which features a ballet class for children. Get down with a break dancer coloring page! Give this dancer some hip-hoppin colors, and as you color try a few moves of your own. Sing the classic song "Pop Goes the Weasel" while coloring in the matching pictures. It's easy to see what's on the water. But it's a lot more fun to imagine all of the creatures swimming below the surface. The world is full of amazing and unusual things. Draw what you see when you look out of the window or imagine something you'd like to see. This piano is animated, and delighted to see you! It needs some color, can your child help? Enjoy this musical coloring page with your child. Did you know that the banjo actually originated in Africa? Enjoy a fun coloring page featuring this cool musical instrument.